Some of my favourite reviews in the past have often been theatrical adaptations of works from a variety of sources, primarily film, television or literature. You can imagine my intrigue and excitement, then, when I had the opportunity to review a folk opera concept album adaptation from a respected and admired singer-songwriter. Any guesses? I am of course talking about Anaïs Mitchell’s ‘Hadestown’, the musical adapted from her 2010 album of the same name, recently reworked with director Rachel Chavkin and premiering at the National Theatre of Great Britain before heading to Broadway. 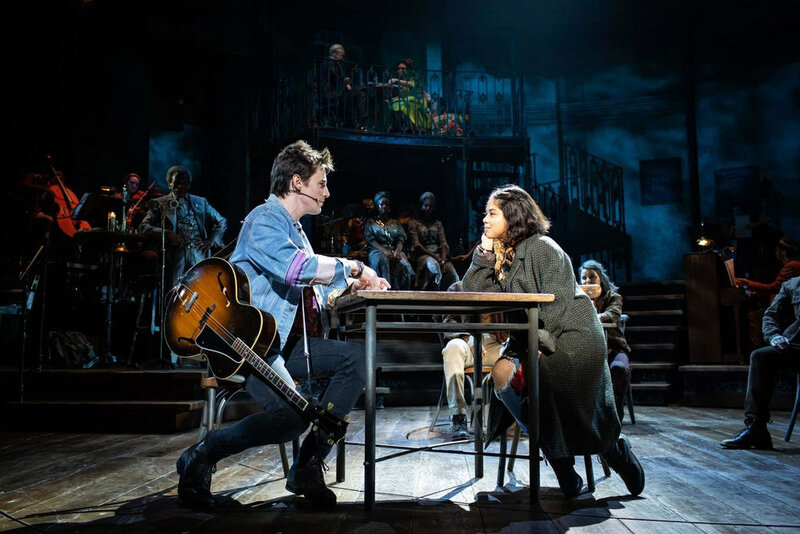 ‘Hadestown’ is a modern retelling of the myth of Orpheus (Reeve Carney) and Eurydice (Eva Noblezada), set against the backdrop of a post-apocalyptic world where, out of desperation, a poverty-stricken nation flicks to Hadestown, an industrial underworld ruled by the cruel business tycoon overlord Hades (Patrick Page) and his companion Persephone (Amber Gray). Through narrator Hermes (André De Shields), a fluid chorus, New Orleans style jazz and modern American folk music, we see the two lovers come up against a world that wants to tear them apart. After leaving the National’s Olivier Theatre and sitting down to write this review, there’s no doubt in my mind when I say this: ‘Hadestown’ is one of the most affecting, meaningful and beautifully executed musicals I’ve ever had the privilege of reviewing. Under Chavkin’s innovative direction, Mitchell’s adaptation transforms into a piece that celebrates the Greek attitude to traditional storytelling. That age old tradition reminds us of the importance of telling stories, both joyful and melancholy, in a bid to glean meaning and affirmation from them, and discover what it is that makes us human. Chavkin and Mitchell’s piece is woven and bound by this very fabric, with Chavkin’s, directorial vision placing the musicians at the edge of a circular space where Mitchell’s narrative takes place, with the Olivier being transformed into a space where performative gesture and musicality are amplified by the storytelling dialogue. At the heart of this dialogue are Mitchell’s songs, which draw upon the folk and blues genres to give us a sense of the story being traditional, archaic, yet refreshingly modern and powerful. Our core performers - Carney, Noblezada, Page, Gray and De Shields - take on the majority of these duties, crafting expertly conceived performances that blend the power of musical storytelling with sensitively characterised portrayals. Their performances are shaded with the confidence and poise, and they become robust emotional canvasses whom we can trust with sharing Mitchell’s story with us. The ensemble of performers buttressing the primary characters act as an incredibly physical, enthralling storytelling tool, radiating atmosphere and mood from their fluid portrayals of the inhabitants of Mitchell and Chavkin’s play-world to knock-out effect. Binding all of the aforementioned aspects together is a well-crafted scenography that heightens the imaginative possibilities one can only find in darkened theatres at the hands of live storytelling. Rachel Hauck’s set design impressionistically gives us a sense of being in a Louisiana bar at the edge of the world, which allows us to embark on the epic journeys and narrative threads whilst still feeling as though we’re simply being told a vital folk tale over a drink. Add into the mix a clever floor space that makes use of revolving treadmills that amplify the size of Mitchell and Chavkin’s play-world, along with a cinematic lighting design from Bradley King, and you’ve got the perfect canvas on which the vibrant emotive colours of the narrative come together to harmonise. Through these design aspects, along with well-considered portrayals and a strong, truthful bond shared amongst the performers, ‘Hadestown’ ignites that special, shared imaginative spark amongst its spectators. Beyond the confines of the performance space, in the limitless depths of what we can conjure up when stimulated by Mitchell’s music and Chavkin’s directorial orchestrations, we see the verdant green fields Orpheus longs for collide with the pluming industrial behemoth cultivated by the power-hungry Hades. Amongst this conflict, amidst the musicians dotted at the side of the performance space, we find the tangible quality all theatre strives to give us: meaning and truth. With flair and finesse, ‘Hadestown’ delivers this meaning and truth, but also the sense of possibility. As an actor-musician, I wonder what meaning we might glean from a ‘Hadestown’ whose entire ensemble of workers and inhabitants tap into the bolstering and atmospheric qualities of live music and instruments, as opposed to the musicians in the piece achieving this at the sides of the performance space. Its current formula works incredibly well, however, and I ponder that vision from a thought train of inspired creativity and artistic respect for the minds behind this breathtaking piece of theatre. From what I’ve seen, ‘Hadestown’ is always growing, ever since its origins in the New York Theatre Workshop, and I’m excited by where it will end up when it heads to Broadway next year. ‘Hadestown’ is one of the most incredible shows you’ll ever see. If OnStage Blog gave stars, I’d give it every star under the blanket of which Orpheus remarks ‘Let the world we dream about be the one we live in right now.’ That quote in particular rings true, if not primarily for its societal and political relevance, but because I feel ‘Hadestown’ has a lot to teach about how musicality and live storytelling in modern musicals, as well as theatre in general, should strive to be. As I enter my sixth year as a reviewer and a new chapter in my journey as an actor-musician, ‘Hadestown’ truly is an inspiration and a reminder of what’s possible under the banner of artistic and creative integrity.